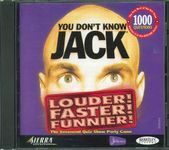 You Don't Know Jack Louder! Faster! Funnier! Pop culture trivia game that is formatted like a television game show. There are 3 rounds of increasing value and a host who will insult contestants who miss questions. Up to 3 players can play using the same keyboard as a buzzer to answer questions.